On Saturday 6th of October we welcomed over 50 visitors to our Derby works from the Turret Clock Group, of the Antiquarian Horological Society (AHS). 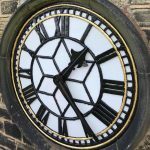 The group promotes knowledge about turret clocks, with a wider role of encouraging the study in all matters relating to the art, history and measurement of time. 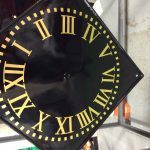 The AHS also conduct important research, along with encouraging the preservation of both horological and associated arts across the county. The group visited several Derbyshire churches, before heading to Smith of Derby for lunch and a tour of our prestigious works. During the afternoon the AHS conducted their Annual General Meeting, where it was agreed to offer free membership to the AHS for all our apprentice clockmakers, both now and in the future. We are very proud to have hosted such an event and we hope that a great day was had by all that attended! Joe Smith; 5th generation of Smith family; and Managing Director Bob Betts show guests around the works. Those who live in the Derby area may have spotted our new sign on the front of our works. The sign was designed, fabricated and installed ‘in house’ by our talented team and was looking splendid in the early Autumn sunshine recently. 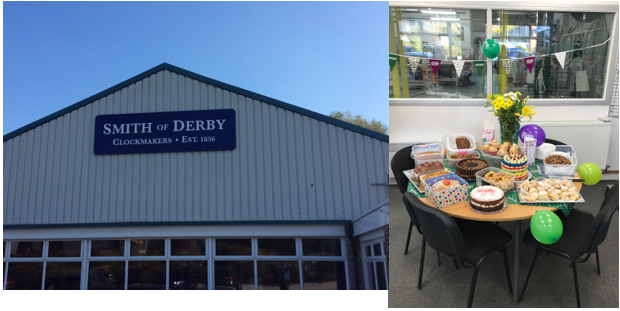 The new sign on our works and the teams baking efforts for the Macmillan coffee morning. On Tuesday the 9th of October the team participated in the annual Macmillan coffee morning. Everybody got involved baking cakes, scones and biscuits before selling them around the works with all proceeds going to the Macmillan charity. We are delighted to say that we raised £242 for the charity and certainly enjoyed eating the yummy treats! Jim Foster, Eric Beardow and Barbara Parkins receiving their awards. We have also been celebrating three team members long-service awards. Our Sales Director Jim Foster celebrated 20 years at Smith of Derby, whilst both Eric Beardow and Barbara Parkins celebrated 30 years at the company. Congratulations to the three of them, all their hard work over the years is very much appreciated!